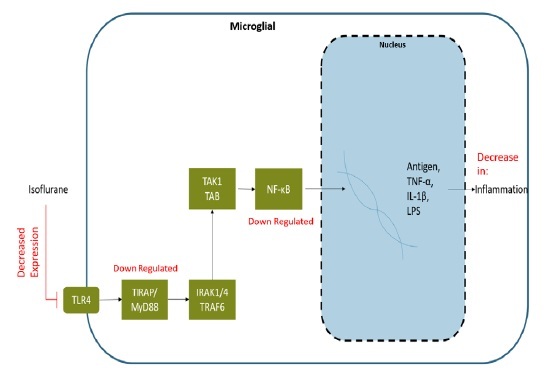 Figure 2: Isoflurane's anti-inflammatory pathway in microglia. Note: Isoflurane downregulates the TLR4 receptor on microglial cell surface. By inhibiting TLR4, NF-κB is attenuated and a decreased expression of: Antigen, TNF-α, IL-1β and LPS inflammatory proteins. Isoflurane inhibits the MyD88/TRAF6/ TAK1/NF-κB cascade and leads to a decrease in overall inflammation.28-31 TLR4: Toll like receptor 4; NF-κB: nuclear factor kappa B; TNF-α tumor necrosis factor alpha; IL: interleukin; LPS: lipopolysaccharide.